Media Confidential: Classic Rocker WTPA Sold! Format Change Next? Classic Rocker WTPA Sold! Format Change Next? UPDATE Monday 1pm: Inside Radio is reporting new owner Patrick Sickafus as saying rock & roll is "here to stay". This would be welcomed news for employees and fans of WTPA, but this plan has not yet been unconfirmed. The trust created when Cumulus merged with Citadel has announced intentions to sell spin-off WTPA 92.1 FM in the Harrisburg, PA. market. The potential buyer is Patrick Sickafus and the sale price was announced at $530,000. A bargain basement price. The trust apparently is really eager to unload the station. 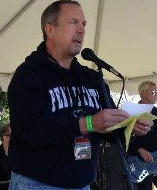 Sickfus is the owner of class country WWSM, 1510 AM in nearby Annville, PA. Sickafus’ professional name is Pat Garrett who owns several other enterprises. He’s also touring country musician, but he is not the well-known radio voice-over talent of the same-name. Listeners to WTPA, long known as the Rock of Central PA, are fearful a format change is coming. In order to save the format on WTPA, program director and morning announcer Chris Tyler last June launched a campaign to get WTPA fans to register their support for the station’s classic rock format. WTPA, was formerly owned by Cumulus Media Inc., it is one of two local stations - the other being former Citadel Broadcasting country station WCAT-FM 102.3 in Carlisle — left in trusteeship following a 2011 merger between Cumulus and Citadel. Cumulus, with 570 stations in 150 markets, is the second largest owner of radio stations in the country, trailing only Clear Channel Communications. LISTEN TO WTPA, Click Here. Although Cumulus receives profits from both stations in the wake of the Citadel deal, they are operated as independent stations under the trusteeship of Potential Broadcasting LLC. The decision to sell the stations was made in a deal with federal regulators in order to meet FCC limitations on media ownership in a given market. RADIO DISCUSSIONS BOARD IS BUZZING, Click Here. Opinion: Can Clear Channel Be Cool? Who Will Be the Next Justin Bieber?